Brookhaven Retreat ® LLC, a unique residential treatment facility exclusively for women with mental health and/or substance abuse issues, relays information about Melanoma/Skin Cancer Detection and Prevention Month to clients and staff members in May 2016. Brookhaven Retreat ® LLC, a unique residential treatment facility exclusively for women with mental health and/or substance abuse issues, will relay information about Melanoma/Skin Cancer Detection and Prevention Month to clients and staff members in May. 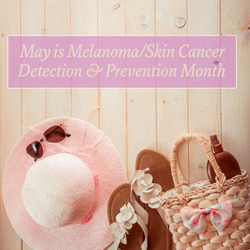 According to the American Academy of Dermatology, skin cancer is the most common form of cancer in the U.S. Approximately every hour, someone dies from melanoma, the deadliest of skin cancers. This year’s campaign is “Looking Good in 2016,” a theme meant to encourage people to protect themselves from harmful ultraviolet rays and to have regularly scheduled skin cancer screenings. The Skin Cancer Foundation defines the disease as the uncontrolled growth of abnormal skin cells, which occur when unrepaired DNA damage to skin cells (most often caused by ultraviolet radiation from sunshine or tanning beds) triggers mutations, or genetic defects, that lead the skin cells to multiply rapidly and form malignant tumors. 1 in 5 Americans will develop skin cancer in the course of a lifetime. Your risk for developing melanoma doubles if you have had more than five sunburns. Regular daily use of SPF 15 or higher sunscreen reduces risk of melanoma by 50 percent. Nearly 50 percent of Americans who live to age 65 will have skin cancer at least once. It is effective to cover up with clothing, a broad-brimmed hat and UV-blocking sunglasses. It is effective to use a broad-spectrum (UVA/UVB) sunscreen with an SPF of 15 or higher every day, and for extended outdoor activity, use a water-resistant sunscreen with an SPF of 30 or higher. It is effective to examine your skin from head to toe every month. It is effective to sit in the shade between 10 a.m. and 4 p.m. to protect yourself from harmful sun exposure. Newborns should be kept out of the sun. For babies older than six months, sunscreen should be used. Melanoma – Appears uneven, changes in appearance, and has a variety of colors including, black, flesh-tone, pink, red, and purple. Basal Cell Carcinoma (BCC) – look for open sores, red patches, pink growths, shiny bumps, and scar-like areas. Actinic Keratosis (AK) – look for scaly or crusty patches; red or brown patches; rough, elevated bumps, and blood-filled cracks on the lower lip. Squamous Cell Carcinoma (SCC) – look for red patches, elevated growths, wart-like crusty growths, and open sores that bleed. The Skin Cancer Foundation recommends monthly self-exams to look for spots that are either new or changing. If a spot looks suspicious, see a doctor. But first, have a doctor conduct a full-body exam to check all moles, spots, and freckles to be sure they are normal.